Soupy Sales. Johnny Ginger. Auntie Dee. Sonny Eliot. Robin Seymour. Bill Bonds. The list of characters who entered our living rooms through Detroit television is long and colorful. This one-hour DVD documentary examines local TV from the late 1940s to the 1990s. 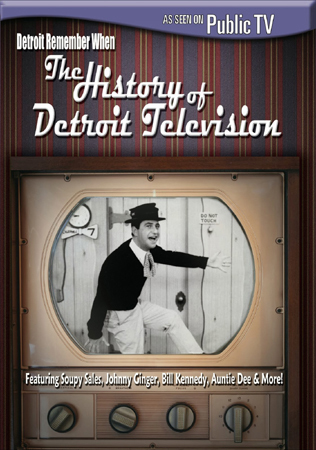 Highlights include rare footage with an amazing vocal performance by 14-year-old Ursula Walker, who today is a Detroit jazz legend; profiles of Soupy Sales, Sonny Elliot, Bill Kennedy and other local celebrities; the story behind one of the longest-running TV series in America, Detroit’s American Black Journal; recollections from Mitch Ryder and others, vintage Detroit commercials and much more. DVD extras include George Pierrot's Detroit, highlights from a rare 1952 WWJ sales film, scenes from The Incredible 60s, a WJBK documentary and Looking Back, a slide presentation. Detroit Remember When: The History of Detroit Television was produced by Michael Collins, Ed Golick, Bill Kubota and Tim Kiska. Orders filled by "Detroit Memories."